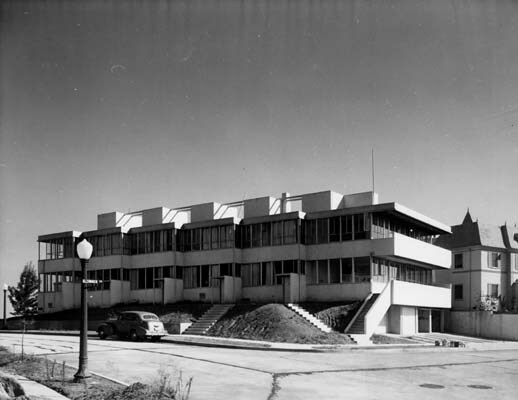 The Landfair Apartments were designed by architect Richard Neutra and constructed in 1937. On the left below is a 1939 photo of the apartments. On the right is a contemporary photo. 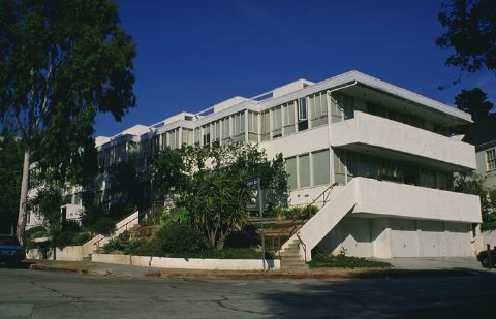 Designed by Richard Neutra in 1937 as five townhouses and two flats, this structure was poorly converted to post-war educational housing and then to co-operative housing for 73 UCLA students. The balconies and glazing on the exterior were removed and restored to their original configurations while adding full upgrades for disabled access and seismic codes. The interiors were carefully converted to dormitory-style housing while maintaining the separate identity of individual townhouse entries and character defining historic spaces and finishes. One unit was maintained in its original interior configuration to document Neutra's original townhouse design. Built-in desks and storage cabinets were designed and detailed in the style of Neutra’s original design documents. 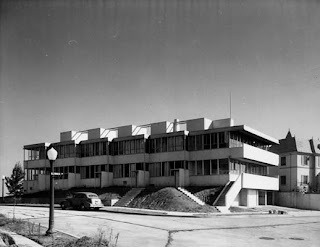 The Landfair Apartments are City of Los Angeles Cultural Monument No. 320. The address is 516 Landfair Avenue.